Have you kept up your New Year’s resolutions? We don’t know about you but we find resolutions are much easier to keep when we actually want to do them! To that end, we’ve created a fun 2018 “must” list for visitors to Taos. From cultural celebrations to relaxing hot springs, there are plenty of “musts” to try all year long. What will your first adventure be? 1. Enjoy the Snowy Trail Life: Snowshoeing and cross-country skiing are both great ways to discover the natural beauty of Taos in the winter. 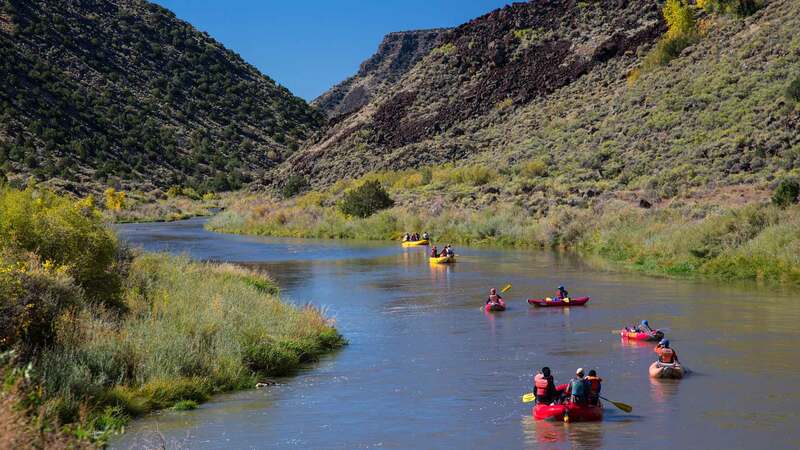 West Rim Trail starts in the parking lot of the Rio Grande Gorge Visitor Center, and is one of the best trails for sliding and gliding is Taos. The natural landscape of the gorge is breathtaking — a perfect way to commune with mother nature in the heart of winter, or any time of year. 2. Visit a National Monument: Discover the Rio Grande del Norte public lands — proclaimed a national monument in 2013 by President Obama. The landscape is rugged, with wide-open plains, volcanic cones and steep canyons (with rivers tucked away in their depths). The unique setting of the monument provides a myriad of recreational opportunities, from whitewater rafting and fishing to hiking and mountain biking. 3. View Artistic Inspirations: A source of inspiration and muse of Georgia O’Keeffe and Ansel Adams — who were fascinated by its adobe contours and sculptural buttresses — the famous San Francisco de Asis Church continues to be an integral part of the spiritual community of New Mexico. Don’t miss the 18th century oil painting “The Shadow of the Cross,” which used to hang inside the church and now resides in the Parish Hall. When the lights went dark, the painting would mysteriously glow … now visitors can only view it in the dark. 4. Soak It Up: Located along the beautiful canyon of the Rio Grande, Black Rock Hot Springs is a unique place to visit. This small collection of hot springs was captured into one soaking pool. During the winter, and especially during spring runoff, the hot water will be completely inundated by cold river water — and impossible to locate. The pool frequently gets washed out, too, so this adventure is not without its risks. (Speaking of which, clothing is optional …). 5. Celebrate the Taos Fiestas: Taos embarks on a cultural journey July 20-22 for Las Fiestas De Taos. A celebratory tradition passed from generation to generation, the Fiestas preserve the rich tri‐cultural way of life that developed in Taos over the last four centuries. This culture is unique to Taos, encompassing pueblo and plains Indians, Spanish explorers, conquistadores, French fur trappers and American mountain men. Music, parades, food and drink, and shopping all have a place at this not-to-be-missed festive event.